There have been a number of designers who've experimenting with incorporating Braille – or a tactile system for visually impaired people – into the mainstream system. 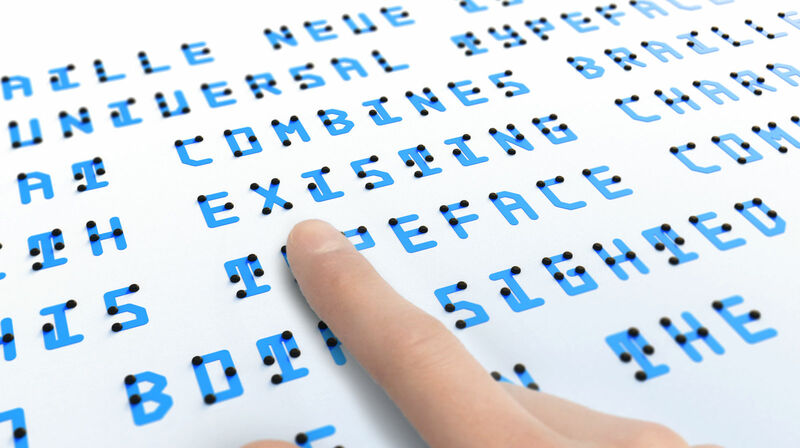 Last year a low cost printer dubbed b.my.jet which can print Braille was launched, we spoke to Viktoriya Grabowska about her digital typeface for visually impaired people and most recently, Elia Frames, a tactile reading system is about to launch on Kickstarter. But we’re most struck by designer Kosuke Takahashi’s Braille Neue work-in-progress project – a universal typeface that combines Braille with existing English (seen below) and Japanese characters, so it communicates to both sighted and visually impaired people in the same space. Using Braille Neue means existing signage would only need to be slightly adjusted to incorporate visually impaired people. We currently rarely see Braille implemented in public spaces, probably because the extra space for Braille hasn’t been prioritised. After all, there hasn’t been an easy correlation between Braille and the shapes of Latin glyphs, so there has been no easy way to place the two side by side, or on top of each other – until now. Braille Nueve places tactile Braille dots over existing Latin and Japanese characters and letters (only a slight adjusting of kerning on existing signage would be needed) so visually impaired people could be adopted into existing infrastructure, helping to keep a "sustainable and inclusive future", according to the typeface’s dedicated website. Its designer, Kosuke Takahashi is a Japanese designer specialising in planning and prototyping at a Tokyo computer consultant, Ohako. At the age of 25 years old, his "phonevert" collaborative project, which looks at reusing the smartphone for other purposes, was recognised at the Beazley Designs of the Year in 2016. He conducted research to see if large scale signage with Braille Neue was actually readable for visually impaired people, such as signs leading to terminals and toilets. He found that as long as there is a six-dotted pattern, it is possible for them to read the signs regardless of its size. 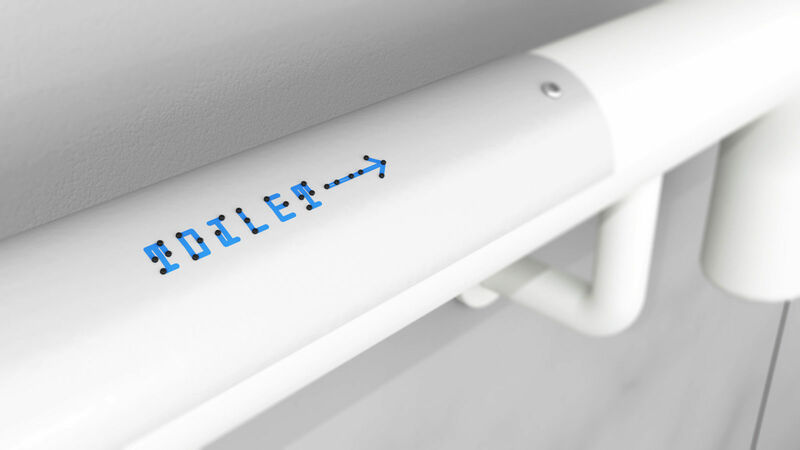 “Braille tends to be small and invisible, but with Braille Neue, it has the possibility to expand spatially into public signage in new ways,” he says. Kosuke began designing his typeface with the Braille grid on top of Japanese characters, but this was too difficult to begin with. He resulted to using Latin glyphs to prove his concept, but as you can see below, not every letter is perfectly legible at speed, such as his I and T. He says these can be adjusted in the future. 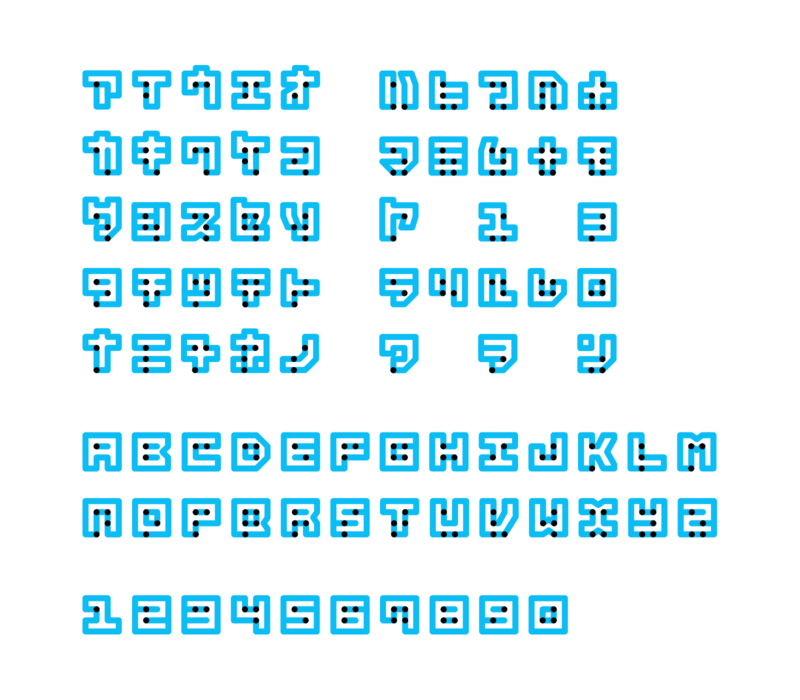 There’s currently two fonts, Braille Neue Standard (Latin Alphabet) and Braille Neue Outline (Japanese and Latin Alphabet), which is seen below. 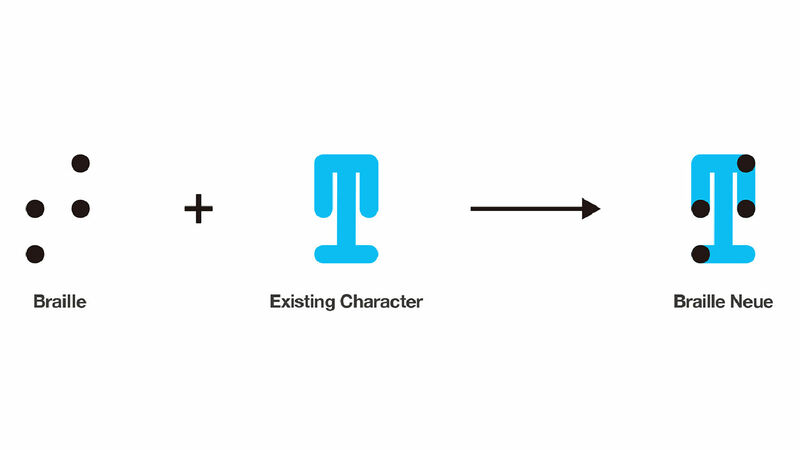 Of course, he mentions attempts to combine Braille with existing characters has been experimented with by various designers already, of which he used as references for Braille Neue. They include Visual Braille (2009) by Christopher Heller, Braille Fonts (2014) by Larysa Kurak and Blind Words (2015) by Nuria Lopez. Braille Neue is currently still a work-in-progress project, but Kosuke hopes to implement Braille Neue at the 2020 Tokyo Olympics and Paralympics, according to Fast Co Design.